Forming actionable plans out of collaborative sessions can be challenging. That’s why moderators play an integral role in most discussions and debates—regulating the discourse to help arrive at conclusions. 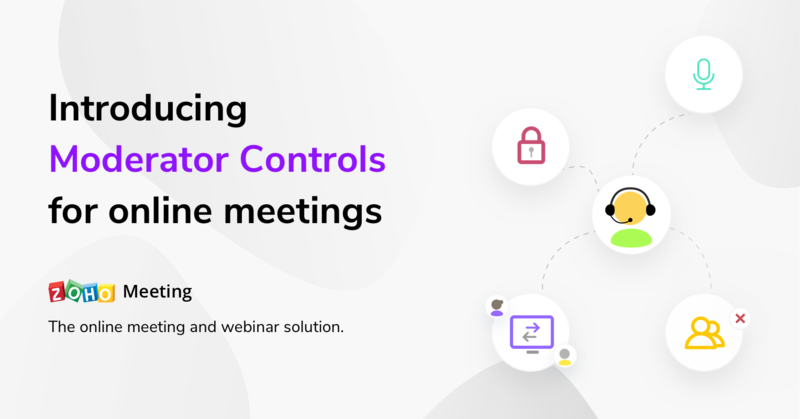 To empower moderators conducting online meetings, Zoho Meeting is introducing Moderator Controls. Lock your meetings to minimize interruptions when a useful discussion is underway. Once locked, no one can join, even if they have the ‘join’ link. And if someone does attempt to join, you can choose to allow them in, or keep the meeting closed. Locking your meeting keeps you safe and protects your privacy. Give anyone a chance to share their screen and illustrate their point using the Switch presenter feature. Participants can share documents, presentations, spreadsheets, or any other application, via screen sharing. They can also select and share the screen of any monitors they’re connected to. Encourage productive ideas and suppress noise to arrive at solutions faster. Mute individuals or all participants to cancel background noise that might be interfering with your session. If someone has been dominating the conversation, you can mute them to step in and encourage others to speak up. When a discussion is going off course, simply mute all participants to get things back on track. Ensure the right people are in your online meetings. If someone inadvertantly joins or is no longer connected to the topic of discussion, just remove them and move on. This helps to reduce distractions and reach better conclusions faster.